Dr. Douglas Fudge & Hagfish | WhaleTimes, Inc. I shared a few of your questions with Douglas S. Fudge, a fascinating biologist with the Comparative Biomaterials Lab at Chapman University. Dr. Fudge was kind enough to help us understand and appreciate this incredible fish. Dr. Fudge, what was your first thought when you heard that hagfish finally got their own holiday? DF: What took so long? What should kids know should about hagfish? DF: Where to begin? Hagfish can tie themselves in knots. Hagfish can pass their body through a knot to wipe slime off. Hagfish can use knot-tying to gain leverage when feeding on carcasses. Hagfish can be bitten by a shark and not be injured. They can burrow into a rotting whale carcass to feed and not worry about the lack of oxygen in there. Hagfish are supremely good at detecting dead things that fall to the ocean floor. Hagfish have multiple hearts. Hagfish can also go months at a time without feeding. I could go on! What is the most amazing thing about hagfish? DF: Definitely the slime. Did I mention the slime? Do you and your team really study slime? DF: Yes, we really study the slime, which I admit sounds a bit silly. 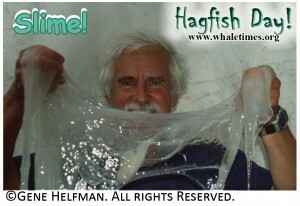 Hagfish slime is not your usual slime. They can produce liters of it in a fraction of a second and it contains thousands of silk like fibres. Our best hypothesis about its function is that it deters attacks by fish predators by clogging their gills. We are currently trying to understand how the stuff that comes shooting out of the slime glands and transforms so quickly into such a large volume of slime. We are also studying the cells that make the silk like fibers, which are some of the strangest cells in the animal kingdom. We are also doing biomimetic research on how we might be able to produce artificial fibers that are as strong and tough as hagfish slime threads. This is really important…are you wearing a slime shirt right now? DF: I am, mostly as a precaution against fish predators. How does increased and larger scale fishing deeper in the ocean impact hagfish? DF: Many hagfish populations are declining due to overfishing for both food and leather (marketed as “eelskin”). Hagfish are slow to reproduce and easy to catch with baited traps, so it is all too easy to wipe them out. Why do you think a hagfish is cooler than a killer whale? DF: Killer whales are cool, but can they themselves into knots? Can a killer whale suffocate a shark? Can a killer whale produce a mass of slime over 100 times larger than itself? Do you think “the beauty that is hagfish” might intimidate other animals? DF: I don’t think this is something they worry too much about. How long have you been studying hagfish? DF: I’ve been studying hagfish for 20 years, mostly in the lab, but I’d very much like to study them in their natural habitat. How can I help hagfish? DF: It’s refreshing to get this question (it’s not one I get very often). I asked our resident hagfish and overwhelmingly they said burial at sea. You can also support initiatives to regulate the harvest of hagfishes, most of which are currently unprotected. Encourage governments to put limits on trawling, which can be destructive to hagfish habitat, and support the establishment of marine protected areas, are also things that would help hagfishes. DF: Visit our website at and support government funding for basic, discovery based research. What do you want people to learn/discover while they celebrate Hagfish Day? DF: I think the most important lesson of Hagfish Day is that it’s not just the cute marine mammals that are deserving of our attention and protection. Hagfishes have been on this planet for about half a billion years and there is much we can learn from them. **A special thanks to Dr. Fudge for helping us celebrate Hagfish Day. Dr. Fudge’s research at the time of the interview was supported by funding from the Natural Sciences and Engineering Research Council of Canada.